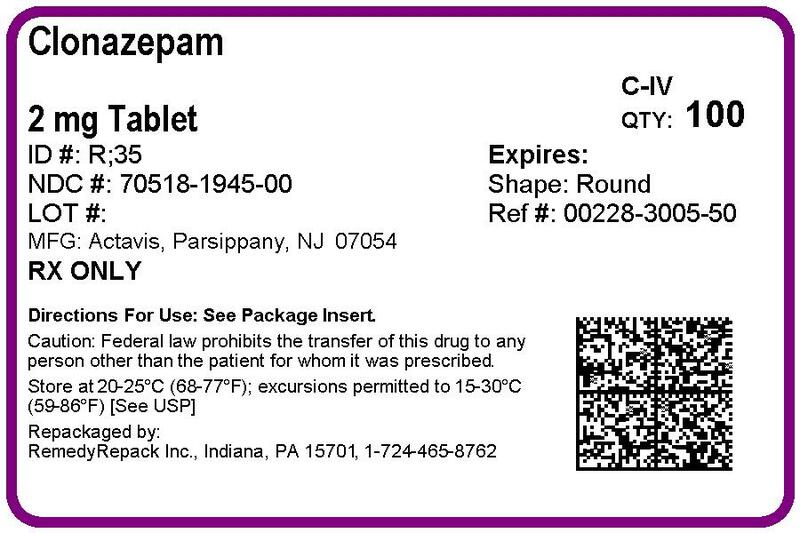 Proprietary Name: Clonazepam What is the Proprietary Name? Clonazepam with NDC 70518-1945 is a a human prescription drug product labeled by Remedyrepack Inc.. The generic name of Clonazepam is clonazepam. The product's dosage form is tablet and is administered via oral form. FDA Application Number: ANDA074869 What is the FDA Application Number? Reserve concomitant prescribing of these drugs for use in patients for whom alternative treatment options are inadequate.Limit dosages and durations to the minimum required.Follow patients for signs and symptoms of respiratory depression and sedation. PharmacodynamicsThe precise mechanism by which clonazepam exerts its antiseizure and antipanic effects is unknown, although it is believed to be related to its ability to enhance the activity of gamma aminobutyric acid (GABA), the major inhibitory neurotransmitter in the central nervous system. Panic Disorder: The effectiveness of clonazepam in the treatment of panic disorder was demonstrated in two double-blind, placebo-controlled studies of adult outpatients who had a primary diagnosis of panic disorder (DSM-IIIR) with or without agoraphobia. In these studies, clonazepam was shown to be significantly more effective than placebo in treating panic disorder on change from baseline in panic attack frequency, the Clinician’s Global Impression Severity of Illness Score and the Clinician’s Global Impression Improvement Score. Study 1 was a 9-week, fixed-dose study involving clonazepam doses of 0.5 mg/day, 1 mg/day, 2 mg/day, 3 mg/day or 4 mg/day or placebo. This study was conducted in four phases: a 1-week placebo lead-in, a 3-week upward titration, a 6-week fixed dose, and a 7-week discontinuance phase. A significant difference from placebo was observed consistently only for the 1 mg/day group. The difference between the 1 mg dose group and placebo in reduction from baseline in the number of full panic attacks was approximately 1 panic attack per week. At endpoint, 74% of patients receiving clonazepam 1 mg/day were free of full panic attacks, compared to 56% of placebo-treated patients.Study 2 was a 6-week, flexible-dose study involving clonazepam in a dose range of 0.5 mg/day to 4 mg/day or placebo. This study was conducted in three phases: a 1-week placebo lead-in, a 6-week optimal-dose and a 6-week discontinuance phase. The mean clonazepam dose during the optimal dosing period was 2.3 mg/day. The difference between clonazepam and placebo in reduction from baseline in the number of full panic attacks was approximately 1 panic attack per week. At endpoint, 62% of patients receiving clonazepam were free of full panic attacks, compared to 37% of placebo-treated patients.Subgroup analyses did not indicate that there were any differences in treatment outcomes as a function of race or gender. Lennox-Gastaut syndrome (petit mal variant), akinetic, and myoclonic seizures. In patients with absence seizures (petit mal) who have failed to respond to succinimides, clonazepam may be useful. Clonazepam tablets, USP are indicated for the treatment of panic disorder, with or without agoraphobia, as defined in DSM-V. Panic disorder is characterized by the occurrence of unexpected panic attacks and associated concern about having additional attacks, worry about the implications or consequences of the attacks, and/or a significant change in behavior related to the attacks. Clonazepam tablets are contraindicated in patients with the following conditions:History of sensitivity to benzodiazepinesClinical or biochemical evidence of significant liver diseaseAcute narrow angle glaucoma (it may be used in patients with open angle glaucoma who are receiving appropriate therapy). Antiepileptic drugs (AEDs), including clonazepam, increase the risk of suicidal thoughts or behavior in patients taking these drugs for any indication. Patients treated with any AED for any indication should be monitored for the emergence or worsening of depression, suicidal thoughts or behavior, and/or any unusual changes in mood or behavior. Worsening of Seizures:When used in patients in whom several different types of seizure disorders coexist, clonazepam may increase the incidence or precipitate the onset of generalized tonic-clonic seizures (grand mal). This may require the addition of appropriate anticonvulsants or an increase in their dosages. The concomitant use of valproic acid and clonazepam may produce absence status. :In some studies, up to 30% of patients who initially responded have shown a loss of anticonvulsant activity, often within 3 months of administration. In some cases, dosage adjustment may reestablish efficacy. Laboratory Testing During Long-Term Therapy: Periodic blood counts and liver function tests are advisable during long-term therapy with clonazepam. DRUG ABUSE AND DEPENDENCE,Physical and Psychological Dependence). Paradoxical reactions are more likely to occur in children and in the elderly. Risks of Abrupt Withdrawal: The abrupt withdrawal of clonazepam, particularly in those patients on long-term, high-dose therapy, may precipitate status epilepticus. Therefore, when discontinuing clonazepam, gradual withdrawal is essential. While clonazepam is being gradually withdrawn, the simultaneous substitution of another anticonvulsant may be indicated. Caution in Renally Impaired Patients: Metabolites of clonazepam are excreted by the kidneys; to avoid their excess accumulation, caution should be exercised in the administration of the drug to patients with impaired renal function. Hypersalivation: Clonazepam may produce an increase in salivation. This should be considered before giving the drug to patients who have difficulty handling secretions. Respiratory Depression:Clonazepam may cause respiratory depression and should be used with caution in patients with compromised respiratory function (e.g., chronic obstructive pulmonary disease, sleep apnea). Porphyria: Clonazepam may have a porphyrogenic effect and should be used with care in patients with porphyria. Dose Changes:To assure the safe and effective use of benzodiazepines, patients should be informed that, since benzodiazepines may produce psychological and physical dependence, it is advisable that they consult with their physician before either increasing the dose or abruptly discontinuing this drug. Interference with Cognitive and Motor Performance: Because benzodiazepines have the potential to impair judgment, thinking or motor skills, patients should be cautioned about operating hazardous machinery, including automobiles, until they are reasonably certain that clonazepam therapy does not affect them adversely. Suicidal Thinking and Behavior: Patients, their caregivers, and families should be counseled that AEDs, including clonazepam, may increase the risk of suicidal thoughts and behavior and should be advised of the need to be alert for the emergence or worsening of symptoms of depression, any unusual changes in mood or behavior, or the emergence of suicidal thoughts, behavior, or thoughts about self-harm. Behaviors of concern should be reported immediately to healthcare providers. Nursing: Patients should be advised to notify their physician if they are breastfeeding or intend to breastfeed during therapy. Concomitant Medication: Patients should be advised to inform their physicians if they are taking, or plan to take, any prescription or over-the-counter drugs, since there is a potential for interactions. Alcohol: Patients should be advised to avoid alcohol while taking clonazepam. A sites, and opioids interact primarily at mu receptors. When benzodiazepines and opioids are combined, the potential for benzodiazepines to significantly worsen opioid-related respiratory depression exists. Limit dosage and duration of concomitant use of benzodiazepines and opioids, and follow patients closely for respiratory depression and sedation. max of clonazepam was 20% lower when the orally disintegrating tablet was given with propantheline compared to when it was given alone. The selective serotonin reuptake inhibitors sertraline (weak CYP3A4 inducer) and fluoxetine (CYP2D6 inhibitor), and the anti-epileptic drug felbamate (CYP2C19 inhibitor and CYP3A4 inducer) do not affect the pharmacokinetics of clonazepam. Cytochrome P-450 inducers, such as phenytoin, carbamazepine, lamotrigine, and phenobarbital induce clonazepam metabolism, causing an approximately 38% decrease in plasma clonazepam levels. Although clinical studies have not been performed, based on the involvement of the cytochrome P-450 3A family in clonazepam metabolism, inhibitors of this enzyme system, notably oral antifungal agents (e.g., fluconazole), should be used cautiously in patients receiving clonazepam because they may impair the metabolism of clonazepam leading to exaggerated concentrations and effects. Pharmacodynamic Interactions: The CNS-depressant action of the benzodiazepine class of drugs may be potentiated by alcohol, narcotics, barbiturates, nonbarbiturate hypnotics, antianxiety agents, the phenothiazines, thioxanthene and butyrophenone classes of antipsychotic agents, monoamine oxidase inhibitors and the tricyclic antidepressants, and by other anticonvulsant drugs. MutagenesisThe data currently available are not sufficient to determine the genotoxic potential of clonazepam. 10 mg/kg/day during the period of organogenesis, a similar pattern of malformations (cleft palate, open eyelid, fused sternebrae and limb defects) was observed at all doses, in a low, non-dose-related incidence. The lowest dose tested is less than the maximum recommended human dose (MRHD) of 20 mg/day for seizure disorders and similar to the MRHD of 4 mg/day for panic disorder, on a mg/m2 basis. Reductions in maternal weight gain occurred at doses of 5 mg/kg/day or greater and reduction in embryofetal growth occurred in one study at a dose of 10 mg/kg/day. in utero exposure to clonazepam, physicians are advised to recommend that pregnant patients taking clonazepam enroll in the NAAED Pregnancy Registry. This can be done by calling the toll free number 1-888-233-2334, and must be done by patients themselves. Information on this registry can also be found at the website http://www.aedpregnancyregistry.org/. The effects of clonazepam on the breastfed infant and on milk production are unknown. The developmental and health benefits of breastfeeding should be considered along with the mother's clinical need for clonazepam and any potential adverse effects on the breastfed infant from clonazepam or from the underlying maternal condition. Clinical studies of clonazepam did not include sufficient numbers of subjects aged 65 and over to determine whether they respond differently from younger subjects. Other reported clinical experience has not identified differences in responses between the elderly and younger patients. In general, dose selection for an elderly patient should be cautious, usually starting at the low end of the dosing range, reflecting the greater frequency of decreased hepatic, renal, or cardiac function, and of concomitant disease or other drug therapy.Because clonazepam undergoes hepatic metabolism, it is possible that liver disease will impair clonazepam elimination. Metabolites of clonazepam are excreted by the kidneys; to avoid their excess accumulation, caution should be exercised in the administration of the drug to patients with impaired renal function. Because elderly patients are more likely to have decreased hepatic and/or renal function, care should be taken in dose selection, and it may be useful to assess hepatic and/or renal function at the time of dose selection.Sedating drugs may cause confusion and over-sedation in the elderly; elderly patients generally should be started on low doses of clonazepam and observed closely. Adverse events during exposure to clonazepam were obtained by spontaneous report and recorded by clinical investigators using terminology of their own choosing. Consequently, it is not possible to provide a meaningful estimate of the proportion of individuals experiencing adverse events without first grouping similar types of events into a smaller number of standardized event categories. In the tables and tabulations that follow, CIGY dictionary terminology has been used to classify reported adverse events, except in certain cases in which redundant terms were collapsed into more meaningful terms, as noted below. Placebo (N=294) Somnolence 7% 1% Depression 4% 1% Dizziness 1% <1% Nervousness 1% 0% Ataxia 1% 0% Intellectual Ability Reduced 1% 0%Adverse Events Occurring at an Incidence of 1% or More among Clonazepam-Treated Patients: Table 3 enumerates the incidence, rounded to the nearest percent, of treatment-emergent adverse events that occurred during acute therapy of panic disorder from a pool of two 6- to 9-week trials. Events reported in 1% or more of patients treated with clonazepam (doses ranging from 0.5 mg/day to 4 mg/day) and for which the incidence was greater than that in placebo-treated patients are included. >5% and at least twice that in the placebo patients. Somnolence 37% 10% Depression 7% 1% Coordination Abnormal 6% 0% Ataxia 5% 0%Treatment-Emergent Depressive SymptomsIn the pool of two short-term placebo-controlled trials, adverse events classified under the preferred term “depression” were reported in 7% of clonazepam-treated patients compared to 1% of placebo-treated patients, without any clear pattern of dose relatedness. In these same trials, adverse events classified under the preferred term “depression” were reported as leading to discontinuation in 4% of clonazepam-treated patients compared to 1% of placebo-treated patients. While these findings are noteworthy, Hamilton Depression Rating Scale (HAM-D) data collected in these trials revealed a larger decline in HAM-D scores in the clonazepam group than the placebo group suggesting that clonazepam-treated patients were not experiencing a worsening or emergence of clinical depression. Other Adverse Events Observed During the Premarketing Evaluation of Clonazepam in Panic DisorderFollowing is a list of modified CIGY terms that reflect treatment-emergent adverse events reported by patients treated with clonazepam at multiple doses during clinical trials. All reported events are included except those already listed in Table 3 or elsewhere in labeling, those events for which a drug cause was remote, those event terms which were so general as to be uninformative, and events reported only once and which did not have a substantial probability of being acutely life-threatening. It is important to emphasize that, although the events occurred during treatment with clonazepam, they were not necessarily caused by it. DOSAGE AND ADMINISTRATION). Addiction-prone individuals (such as drug addicts or alcoholics) should be under careful surveillance when receiving clonazepam or other psychotropic agents because of the predisposition of such patients to habituation and dependence. CLINICAL PHARMACOLOGY, Clinical Trials), patients were gradually withdrawn during a 7-week downward-titration (discontinuance) period. Overall, the discontinuance period was associated with good tolerability and a very modest clinical deterioration, without evidence of a significant rebound phenomenon. However, there are not sufficient data from adequate and well-controlled long-term clonazepam studies in patients with panic disorder to accurately estimate the risks of withdrawal symptoms and dependence that may be associated with such use. Symptoms of clonazepam overdosage, like those produced by other CNS depressants, include somnolence, confusion, coma and diminished reflexes. Treatment includes monitoring of respiration, pulse and blood pressure, general supportive measures and immediate gastric lavage. Intravenous fluids should be administered and an adequate airway maintained. Hypotension may be combated by the use of levarterenol or metaraminol. Dialysis is of no known value. Flumazenil, a specific benzodiazepine-receptor antagonist, is indicated for the complete or partial reversal of the sedative effects of benzodiazepines and may be used in situations when an overdose with a benzodiazepine is known or suspected. Prior to the administration of flumazenil, necessary measures should be instituted to secure airway, ventilation and intravenous access. Flumazenil is intended as an adjunct to, not as a substitute for, proper management of benzodiazepine overdose. Patients treated with flumazenil should be monitored for resedation, respiratory depression and other residual benzodiazepine effects for an appropriate period after treatment. PRECAUTIONS, should be consulted prior to use. Flumazenil is not indicated in patients with epilepsy who have been treated with benzodiazepines. Antagonism of the benzodiazepine effect in such patients may provoke seizures. Serious sequelae are rare unless other drugs or alcohol have been taken concomitantly. The use of multiple anticonvulsants may result in an increase of CNS depressant adverse effects. This should be considered before adding clonazepam to an existing anticonvulsant regimen. Adults: The initial dose for adults with seizure disorders should not exceed 1.5 mg/day divided into three doses. Dosage may be increased in increments of 0.5 mg to 1 mg every 3 days until seizures are adequately controlled or until side effects preclude any further increase. Maintenance dosage must be individualized for each patient depending upon response. Maximum recommended daily dose is 20 mg.
Pediatric Patients: Clonazepam is administered orally. In order to minimize drowsiness, the initial dose for infants and children (up to 10 years of age or 30 kg of body weight) should be between 0.01 mg/kg/day and 0.03 mg/kg/day but not to exceed 0.05 mg/kg/day given in two or three divided doses. Dosage should be increased by no more than 0.25 mg to 0.5 mg every third day until a daily maintenance dose of 0.1 mg/kg to 0.2 mg/kg of body weight has been reached, unless seizures are controlled or side effects preclude further increase. Whenever possible, the daily dose should be divided into three equal doses. If doses are not equally divided, the largest dose should be given before retiring. Adults: The initial dose for adults with panic disorder is 0.25 mg twice a day. An increase to the target dose for most patients of 1 mg/day may be made after 3 days. The recommended dose of 1 mg/day is based on the results from a fixed dose study in which the optimal effect was seen at 1 mg/day. Higher doses of 2 mg/day, 3 mg/day and 4 mg/day in that study were less effective than the 1 mg/day dose and were associated with more adverse effects. Nevertheless, it is possible that some individual patients may benefit from doses of up to a maximum dose of 4 mg/day, and in those instances, the dose may be increased in increments of 0.125 mg to 0.25 mg twice a day every 3 days until panic disorder is controlled or until side effects make further increases undesired. To reduce the inconvenience of somnolence, administration of one dose at bedtime may be desirable. Treatment should be discontinued gradually, with a decrease of 0.125 mg twice a day every 3 days, until the drug is completely withdrawn.There is no body of evidence available to answer the question of how long the patient treated with clonazepam should remain on it. Therefore, the physician who elects to use clonazepam for extended periods should periodically reevaluate the long-term usefulness of the drug for the individual patient.Pediatric Patients: There is no clinical trial experience with clonazepam in panic disorder patients under 18 years of age. and 33 on one side and scored on the other side contains 0.5 mg of clonazepam, USP. Tablets are supplied in bottles of 100 (NDC 0228-3003-11) and 500 (NDC 0228-3003-50). and 34 on one side and scored on the other side contains 1 mg of clonazepam, USP. Tablets are supplied in bottles of 100 (NDC 0228-3004-11) and 500 (NDC 0228-3004-50). and 35 on one side and scored on the other side contains 2 mg of clonazepam, USP. Tablets are supplied in bottles of 100 (NDC 0228-3005-11) and 500 (NDC 0228-3005-50). Clonazepam (kloe naz' e pam) Tablets, USP CIVWhat is the most important information I should know about clonazepam tablets?Clonazepam is a benzodiazepine medicine. Benzodiazepines can cause severe drowsiness, breathing problems (respiratory depression), coma, and death when taken with opioid medicines.Clonazepam tablets can make you sleepy or dizzy and can slow your thinking and motor skills. This may get better over time.Do not drive, operate heavy machinery, or do other dangerous activities until you know how clonazepam tablets affect you. Clonazepam tablets may cause problems with your coordination, especially when you are walking or picking things up.Do not drink alcohol or take other drugs that may make you sleepy or dizzy while taking clonazepam tablets until you talk to your healthcare provider. When taken with alcohol or drugs that cause sleepiness or dizziness, clonazepam tablets may make your sleepiness or dizziness worse. Like other antiepileptic drugs, clonazepam tablets may cause suicidal thoughts or actions in a very small number of people, about 1 in 500.Call your healthcare provider right away if you have any of these symptoms, especially if they are new, worse, or worry you:thoughts about suicide or dying new or worse anxiety trouble sleeping (insomnia) acting on dangerous impulses attempts to commit suicide feeling agitated or restless new or worse irritability an extreme increase in activity and talking (mania)new or worse depressionpanic attacks acting aggressive, being angry, or violentother unusual changes in behavior or moodHow can I watch for early symptoms of suicidal thoughts and actions?Pay attention to any changes, especially sudden changes, in mood, behaviors, thoughts, or feelings.Keep all follow-up visits with your healthcare provider as scheduled.Call your healthcare provider between visits as needed, especially if you are worried about symptoms. Suicidal thoughts or actions can be caused by things other than medicines. If you have suicidal thoughts or actions, your healthcare provider may check for other causes.Do not stop clonazepam tablets without first talking to a healthcare provider.Stopping clonazepam tablets suddenly can cause serious problems. Stopping clonazepam tablets suddenly can cause seizures that will not stop (status epilepticus).Clonazepam tablets can cause abuse and dependence.Do not stop taking clonazepam tablets all of a sudden. Stopping clonazepam tablets suddenly can cause seizures that do not stop, hearing or seeing things that are not there (hallucinations), shaking, and stomach and muscle crampsTalk to your healthcare provider about slowly stopping clonazepam tablets to avoid withdrawal symptoms.Physical dependence is not the same as drug addiction. Your healthcare provider can tell you more about the differences between physical dependence and drug addiction. 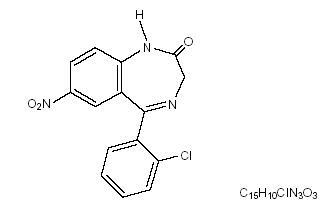 Clonazepam is a federal controlled substance (C-IV) because it can be abused or lead to dependence. Keep clonazepam tablets in a safe place to prevent misuse and abuse. Selling or giving away clonazepam tablets may harm others, and is against the law. Tell your healthcare provider if you have ever abused or been dependent on alcohol, prescription medicines or street drugs. What are clonazepam tablets?Clonazepam tablets are a prescription medicine used alone or with other medicines to treat:certain types of seizure disorders (epilepsy) in adults and childrenpanic disorder with or without fear of open spaces (agoraphobia) in adultsIt is not known if clonazepam is safe or effective in treating panic disorder in children younger than 18 years old.Who should not take clonazepam tablets?Do not take clonazepam tablets if you:are allergic to benzodiazepineshave significant liver diseasehave an eye disease called acute narrow angle glaucomaAsk your healthcare provider if you are not sure if you have any of the problems listed above.Before you take clonazepam tablets, tell your healthcare provider about all your medical conditions, including if you:have liver or kidney problemshave lung problems (respiratory disease)have or have had depression, mood problems, or suicidal thoughts or behaviorhave any other medical problemsare pregnant or plan to become pregnant. It is not known if clonazepam tablets can harm your unborn baby. Tell your healthcare provider right away if you become pregnant while taking clonazepam tablets. You and your healthcare provider will decide if you should take clonazepam tablets while you are pregnant.Studies in pregnant animals have shown harmful effects of benzodiazepine medications (including the active ingredient in clonazepam tablets) on the developing fetus.Children born to mothers receiving benzodiazepine medications (including clonazepam tablets) late in pregnancy may be at some risk of experiencing breathing problems, feeding problems, hypothermia, and withdrawal symptoms. If you become pregnant while taking clonazepam tablets, talk to your healthcare provider about registering with the North American Antiepileptic Drug Pregnancy Registry. You can register by calling 1-888-233-2334. The purpose of this registry is to collect information about the safety of antiepileptic drugs during pregnancy.are breastfeeding or plan to breastfeed. Clonazepam can pass into breast milk. You and your healthcare provider should decide how you will feed your baby while you take clonazepam tablets.Tell your healthcare provider about all the medicines you take, including prescription and over-the-counter medicines, vitamins, and herbal supplements. Taking clonazepam tablets with certain other medicines can cause side effects or affect how well clonazepam tablets or the other medicines work. Do not start or stop other medicines without talking to your healthcare provider.How should I take clonazepam tablets?Take clonazepam exactly as your healthcare provider tells you. If you take clonazepam tablets for seizures, your healthcare provider may change the dose until you are taking the right amount of medicine to control your symptoms.Do not stop taking clonazepam tablets without first talking to your healthcare provider. Stopping clonazepam tablets suddenly can cause serious problems.Clonazepam tablets should be taken with water and swallowed whole. If you take too many clonazepam tablets, call your healthcare provider or local Poison Control Center right away.What should I avoid while taking clonazepam tablets?Clonazepam tablets can slow your thinking and motor skills. Do not drive, operate heavy machinery, or do other dangerous activities until you know how clonazepam tablets affect you.Do not drink alcohol or take other medicines that may make you sleepy or dizzy while taking clonazepam tablets until you talk to your healthcare provider. When taken with alcohol or medicines that cause sleepiness or dizziness, clonazepam tablets may make your sleepiness or dizziness much worse.What are the possible side effects of clonazepam tablets?See “What is the most important information I should know about clonazepam tablets?”Clonazepam tablets can also make your seizures happen more often or make them worse. Call your healthcare provider right away if your seizures get worse while taking clonazepam tablets.The most common side effects of clonazepam tablets include:drowsiness � problems with walking and coordination dizzinessdepression fatigueproblems with memoryThese are not all the possible side effects of clonazepam tablets. Call your doctor for medical advice about side effects. You may report side effects to FDA at 1-800-FDA-1088. You may also report side effects to Actavis at 1-800-432-8534. Inactive ingredients: corn starch, lactose monohydrate, magnesium stearate, and microcrystalline cellulose. The 0.5 mg tablet also contains D&C Red #30 aluminum lake. The 1 mg tablet also contains D&C Yellow #10HT aluminum lake.